We have a slight cookie fetish here. I find they are great snack, travel easily, and with just a couple cups of sucanat and palm sugar, they’re not overly sweet. I guess they’d more qualify for “energy bars” then a cookie treat. I ran out of blanched almonds for almond flour, so I thought I would try using almond butter instead. The end result is a nice, chewy cookie, that doesn’t fall apart much like other ones I have made (using g/f and sprouted flours can be so tricky!). Mix butters and sugars. While the mixer is running on low, add soda, eggs and flours – add enough flour to create a good cookie consistency in the batter. 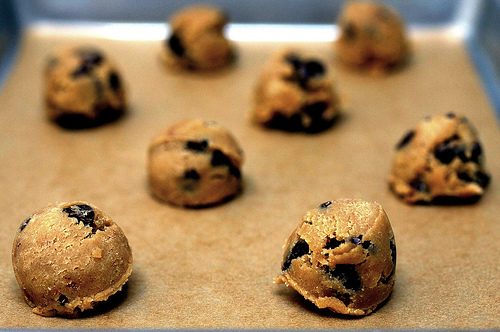 Spoon out onto a stainless steel cookie sheet, bake in a preheated 375 degree oven for about 10-12 minutes. Enjoy with a big glass of fresh milk or hot tea.